My film explores the emotional state of a woman’s mind: her relationship with self, her relationship with the other woman, her relationship with the divine, her relationship with Mother Earth, her relationship with humanity. Her emotional state of mind and her relationship with the other person could have many meanings. I leave the film open to interpretation for everyone. For me, personally, I see the message of the story as the split of a woman and her inner self: her inner self which comes out as a pure, innocent, uncorrupted being and when the inner self witnesses the authentic emotional state of a human filled with hate, genocide, racism, murder, violence, the inner being is shocked and disturbed and turns away from the woman. My film was inspired by one of my favorite films, Persona (1966), a Swedish film by Ingmar Bergman. 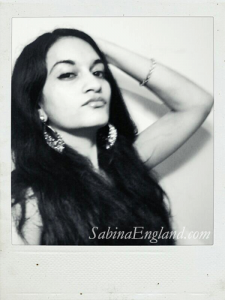 Sabina England is a deaf Indian Muslim filmmaker and stage performance artist. Her plays have been produced in London, UK and a forthcoming play will be produced in Trinidad and Tobago. Sabina wrote and directed her first film, “Wedding Night,” a narrative short, which premiered at Tribeca Cinemas in New York City. Sabina, being deaf, is fluent in American Sign Language and loves to perform poetry, mime, and sign language on the stage. She lives and works in the US.